Catering is a big business today. In fact, there are literally hundreds of catering services in any one location. Consequently, the competition is tough. A catering service must distinguish their business from the crowd by providing a more professional service that really does cater to the needs of their customer. Of course, providing great food, drinks, planning and other services is mandatory. Still, the paperwork is important too. Every catering service must provide the customer with a catering quotation form that is an outline of all the services and the pricing for the services requested. A professionally prepared document is mandatory and important. A professionally prepared document will give the catering service a more professional and positive image that translates to good customer service and attracts even more customer interest. Customers like a company that is prepared with a form that details their service and the prices charged. 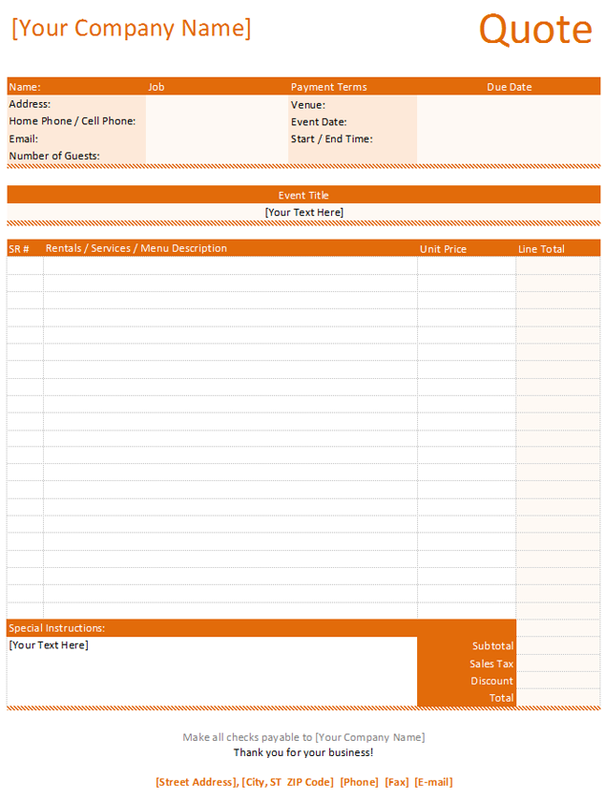 Certainly, the forms are a convenient way for all to keep track of the catering activities too. Of course, a catering service could create the forms from scratch. However, the best course of action for a busy, professional service is to download the templates to make their own catering service quotation forms for the customer. Now, is the perfect time to download a nice quotation template to your computer. The templates are super easy to edit, customize, and print. In addition, the templates are designed in Word and Excel. Consequently, they work with just about any computer. Add your company logo, change the fonts, add extra information or details about your catering service. Always add the customer name at the top of the form, add a serial number to identify the customer, always list the date of the event, time of the event, location, and type of event at the very beginning of the form for quick reference.